Rickey Henderson Collectibles: Is Rickey Upset With the A's? I recently came across a story written by Monte Poole of the San Jose Mercury News, that I found both interesting and a little sad. It seems that Rickey hasn't been on very good terms with the Oakland A's over the past few years, and is a little upset over the way that he has been treated. He says that if it weren't for the fans, and the fact that Oakland is his hometown, he'd like to go into the Hall wearing a....Padres hat! Which is just blasphemy if you ask me! Although he broke both the all-time runs scored and walks records while playing for the Padres, it's definitely not the team with which he's most associated. The whole story can be found below, as well as at this link. Six weeks from today, Rickey Henderson will be the toast of baseball, a first-ballot inductee into the Hall of Fame, standing at the podium wearing an A's cap. And having decidedly mixed emotions about the organization that cap represents. Henderson's decision to go green and gold in Cooperstown is complicated by the perceived sheet of ice between the club and the greatest — and most popular — player in franchise history. "I'm doing it for the fans, for the city, because this is home," Henderson says. "If (Oakland) wasn't home, I don't think I would wear it. Because I don't feel the love." Rickey being Rickey? Maybe. But Rickey has a point. He has not felt the love from his original team for a long time. Drafted by the A's out of Oakland Tech in 1976, Henderson spent 14 of his 25 major league seasons with the A's. He served four stints, under three ownerships, for six managers, the last being Art Howe in 1998. In the decade-plus since, Rickey and the A's have shared one thing. It's as if there is a door to the organization through which Rickey can look but not enter. Though Henderson is always welcome at the ballpark, there has been no sincere invitation to lure him back as a player, coach or as a highly visible community ambassador. Not until this month did the A's reach agreement on a personal services contact with Rickey, allowing him to make appearances on behalf of the team in 2009. The A's say there are plans to do more in the future. "I'm sure there will be further discussion to determine a role for Rickey beyond this year," Ken Pries, the team vice president in charge of several areas, including community relations. "We realize how much Rickey means to our heritage." The roots of Rickey's bittersweet emotions likely lie in the failure to finish his playing career with the A's. His final seasons as an active player were spent with the New York Mets, Seattle Mariners, San Diego Padres, Boston Red Sox and Los Angeles Dodgers — in addition to the Newark Bears and San Diego Surf Dawgs of separate independent leagues. All the while, even as late as 2006, Henderson sought to leave baseball wearing Oakland's green and gold. His very public pleas for one last chance to enter the batter's box in an A's uniform, heard 'round the baseball world, gained no traction within the organization. It became an annual issue, local A's fans approaching general manager Billy Beane in coffee shops and parking lots, asking if Rickey might return for a grand finale. Most had heard that Henderson was willing sign any contract — even a minor-league deal— for the opportunity to prove his worth. Though Beane consistently said he understood the desires of the fans, he also was consistent in saying he was trying to build a team with youth and a few selected veterans who could fill specific needs. Rickey, he always said, was not the right veteran to address those needs. In his last overture, Henderson offered to donate his entire salary to charity. He yearned only for the chance to make the team, insisting he would pack up and go home if it were determined that he was unworthy. Practically begging, Rickey even took his plight to HBO's Bryant Gumbel. And not much in the last couple years, either, as it became apparent Henderson's playing days were over. He accepted invitations from the Mets to come to spring training to teach his considerable baserunning skills. He even spent time as a first-base coach. The A's clearly have moved on. "I would have been happy to work with Ron Washington when he was here," Henderson says, "or maybe come to spring training for a week or two and work with the younger players." Having played for seven other teams, Henderson has seen the treatment other stars get from the organizations with which they are most identified. He knows of Tony Gwynn's iconic status in San Diego, knows what Minnesota thinks of the late Kirby Puckett. 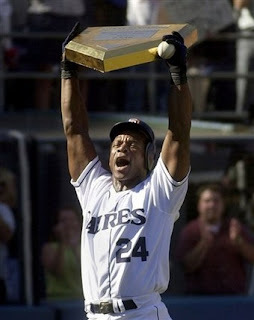 Which makes it all the more painful to Rickey that he can't seem to reconcile with his hometown team. The team with a hold on his heart. "I'm right here," he says. "I spend most of my time around here, right under their nose. I got my arms open to 'em." Part of Rickey wishes he were courageous enough to take a hard stand. If he could, he would wear a Padres cap, he says, because he feels a mutual respect and appreciation. But there's no chance of that. Rickey is committed to wearing an A's cap. It's in his blood. Even if there are times when he wishes it weren't.